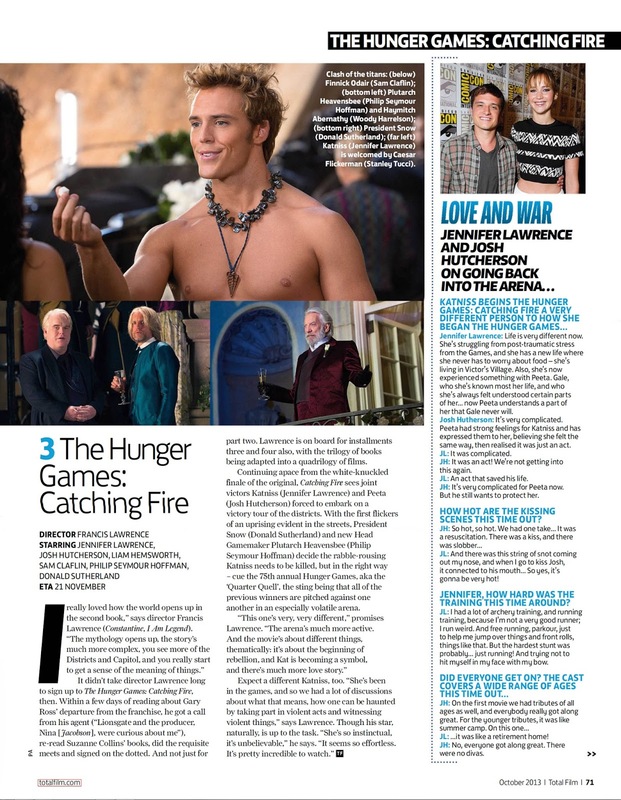 The latest issues of Empire and TotalFilm are on UK newsstands right now, and we've got HQ scans of the full Catching Fire features from both! 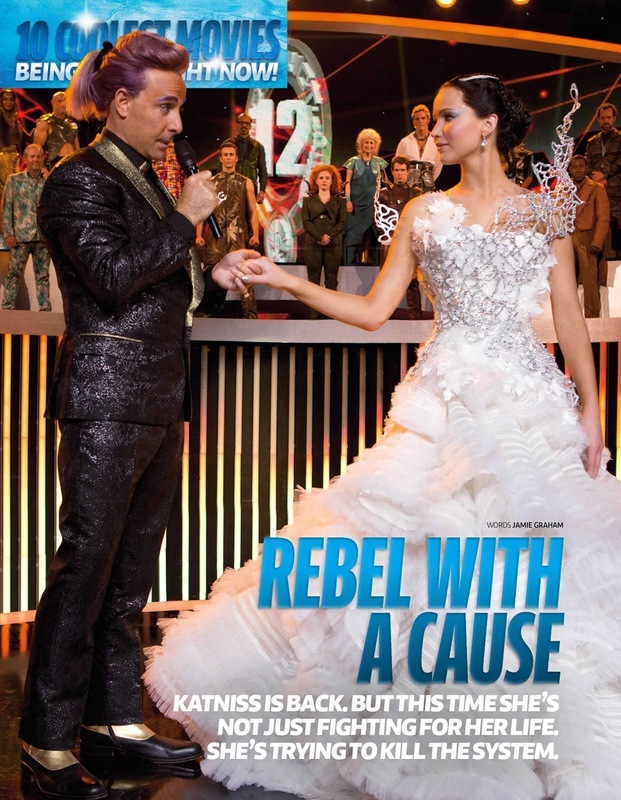 Jennifer Lawrence gives a lengthy interview with Empire, and Francis Lawrence is quoted in both. Empire even got to watch a full 30 minutes of the movie! "From the 30 minutes or so that he shows Empire, Francis Lawrence's take on The Hunger Games has a chillier, bleaker beauty than Ross', which burst with springy greens. It also looks bigger, with desolate landscapes stretching into nothingness, its Panem a lonelier, more forlorn place. "I thought there was a real opportunity to open the world up," says Francis Lawrence. "I didn't get enough of a sense of place in the first movie. I thought we could grow visually, because we were seeing more of the Districts, the Capitol and a whole new arena""
""I was consulted about who the new director would be, yes," she says. "But I’m not delusional. I’m sure that if I’d said I absolutely hated Francis they’d have hired him anyway… fortunately, I think Francis is the smartest decision any studio has ever made."" ""I've taken a month off and now I'm so ready to get back to work," she says. "I actually really worried at the beginning of these movies that I would get so bored playing the same person for so long. 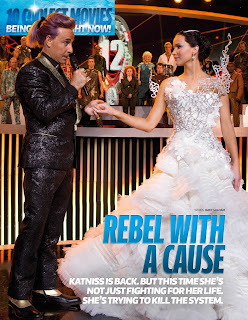 But I still love playing Katniss and am really looking forward to being her again. There's honestly no part of it that I'm bored with...""
Expect a different Katniss, too. “She’s been in the games, and so we had a lot of discussions abut what that means, how one can be haunted by taking part in violence acts and witnessing violent things,” says [Francis] Lawrence. Though his star, naturally, is up to the task. “She’s so instinctual, it’s unbelievable,” he says. “It seems so effortless. It’s pretty incredible to watch."" May I encourage those of you who can to go out and buy these fantastic magazines. 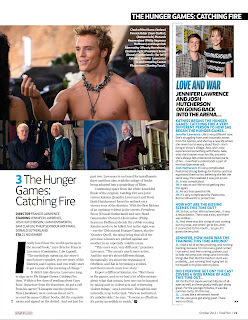 Not only do they have excellent features on Catching Fire, but many other movies are also included, with exclusive pictures and interviews.